Urban agriculture provides an excellent opportunity to integrate community development and youth empowerment while sharing information about growing food in diverse urban settings. In 2015 and 2016, staff from UC SAREP and UC Cooperative Extension partnered with youth participants and staff at non-profit agencies to offer youth-led tours of local urban farms. 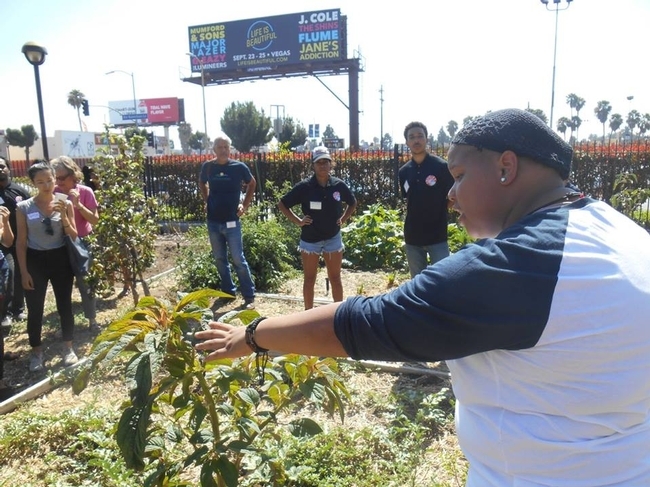 This project gave youth leaders from 10 community-based urban ag organizations an opportunity to share their knowledge and experience with UC personnel, funders, policy makers, urban ag non-profit staff, and other urban farmers. Forty youth ranging from middle school through college age participated in a training on how to tell their personal stories related to urban agriculture before leading tours of their urban farms in the Bay Area, Sacramento and Los Angeles. Videos documented these efforts, including a visit to young people farming in the Bay Area and a virtual farm tour with youth in Los Angeles. The videos show how powerful this experiential education is for both youth and adults, and how UC can continue to work effectively with our communities to build sustainable food systems. Other organizations that would like to host a similar youth-led farm tour activity can access the curriculum and trainer's guide below. Funding from UC ANR and the UC Global Food Initiative made this project possible, along with the support of community partners including Community Services Unlimited, Social Justice Learning Institute, WOW Farm, Berkeley Youth Alternatives, Phat Beets Produce, Acta Non Verba, the Yisrael Family Urban Farm, The GreenHouse, the International Garden of Many Colors, Burbank Urban Garden, and Mutual Housing CA. Urban farmer Mia talks about crops at the Community Services Unlimited Expo Farm in South Los Angeles.